For many of us, it is difficult to understand the fear Republican leaders are demonstrating about the growth in America’s Latino population. This was predicted a decade ago, yet the GOP is acting as if it is recent news. So, who is harming America the most, those undocumented contributors to American society or the GOP? In U.S. Census reports published in 2000, it predicted that the Latino population would grow exponentially based on births and newly arrived undocumented workforce. This was and has been public knowledge since. That same report also stated that Latinos in general would continue to make major contributions to the national economy. It did not predict a drain on American jobs or the reason for the nation’s economic collapse. Today, preliminary U.S. Census reports show that the undocumented workforce has been and continues to be a positive source of revenue for the U.S. economy. Moreover, it also shows that they are not the drain on jobs that Americans want. Instead, they are the saviors of jobs Americans don’t want and wouldn’t take even if it meant getting off the welfare rolls. Here’s a perfect example. Earlier this year the United Farm Workers union put out a national call for U.S. citizens to apply for the many farm hand jobs available in California. Of the millions of unemployed, only three responded, of which only one was actually interested. The other two were discouraged once they found out the pay was minimum wage, more than 8 hours per day, extreme weather conditions, no benefits, and employment was only seasonal. But, the UFW did receive many responses, mostly mean spirited and racist comments. Thank you America for showing your good side. Then there is Arizona’s ill-conceived law, SB 1070, designed to criminalize all Latinos or anyone who remotely looks Latino, passed by a god-fearing legislature and signed into law by former X-ray technician Governor Jan Brewer. It didn’t take much for real lawyers to see through this racist gesture disguised as a law and argue for its removal. The federal judge ruled most of the law to be unenforceable. But this law, nor its appeals, has taken into account the ailing Arizona economy, the decrease in crime along its border with Mexico, and the continuing dependence of illicit drugs by Americans. The lesson here: Elect people who know how to govern, not those who would like to govern. 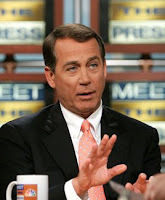 Finally, there’s the issue of the 14th Amendment of the Constitution of the United States, which Congressman and Republican House Minority Leader John Boehner believes should be revisited. In his wise and tempered intellectual statement, Mr. Boehner said on Meet the Press that Congress should look into revising the 14th Amendment to address the issue of children born to undocumented contributors of the American society. What he is suggesting is for the Department of Homeland Security to have field offices in hospitals across America to determine if newborns are related to undocumented workers. The 14th Amendment grants almost every child born in the U.S. full citizenship. Boehner’s statement fell short of suggesting that hospitals hang a sign outside their doors stating LATINOS ARE NOT WELCOME! So why is such an educated and powerful GOP leader involved with this issue? Because some gray-haired, old-fashioned, god-fearing, baby boomer felt intimidated that her neighborhood didn’t look anything like it did in the 1950s, and complained. A GOP candidate for high office heard the complaint and used it to get himself elected. Other GOP candidates saw the result and immediately adopted the same type of platform to get elected, a typical response for descendants of apes. Latinos are becoming a very real and huge political base, like it or not. The more the GOP embraces ill-conceived laws, and continues to make malicious and inaccurate statements about America’s undocumented workforce, the less they will appeal to the Latino voter. Sure, there will still be some Latinos who will go to the dark-side of the GOP, but those who see there is nothing to gain from this will reject the platforms and move toward the middle, where neither the Left or the Right will enter. The GOP is stretching far from its original roots, which will create more division than unification among its ranks. Unfortunately, it’s America that is being harmed by these old schoolyard strategies and mentalities.